Many facility managers point to the lip along the bottom of a traditional shower stall as a prominent tripping hazard, as well as another seam where moisture and bacteria can hide. To remedy this, a growing number of healthcare facilities are designing toilet/shower rooms that are one and the same — what’s sometimes called universal design. Rather than using a shower stall to contain the water, part of the restroom is designated “the shower zone.” The entire floor slopes to a drain within the shower zone; some floors also have a second drain to catch any water that splashes outside the shower. “The floor slopes so anything within the shower stays within the shower zone,” Advocate’s Nelson says. A shower curtain can both delineate this zone and contain much of the spray from the shower. Of course, this means the entire floor needs to be slip resistant. “Don’t exchange a tripping hazard (the shower lip) for a slipping hazard,” Williams cautions. To further reduce the risk of falls, universal restrooms should incorporate a shower seat, Williams says. He points out that many hospital patients are mostly sedentary, and simply standing up can cause a drop in blood pressure. Installing a seat within the shower area may help someone who feels faint avoid a fall. Because infection control is such a priority in healthcare settings, touch- or hands-free faucets, toilets, and urinals have become standard. The goal is to minimize the number of people touching any of the fixtures with dirty hands, potentially spreading infections. There’s a difference between hands-free and touch-free, Tetrault notes. Hands-free fixtures typically are activated by levers that are bigger and can be moved, for example, with one’s elbow. Touch-free fixtures are activated by motion sensors. Crouse Hospital has moved to touch-free fixtures, he says. Along with the fixtures’ infection-control benefits, they won’t run continuously. One key to durable touch-free fixtures is going with those that are hard-wired, versus those that require batteries, Williams says. Many maintenance staffs, already stretched thin, may struggle to replace the batteries on a timely basis. Any healthcare setting needs to withstand frequent, thorough cleanings. Although some facility managers have looked into materials with anti-microbial properties, many remain unconvinced of their effectiveness. Crouse Hospital, for instance, has installed anti-microbial door hardware and run UV cleanliness tests on them. “We’re not seeing them working positive or negative,” Tetrault says. Another concern is the fact that antimicrobial finishes may use products that incorporate some sort of pesticide or insecticide, Brainerd says. 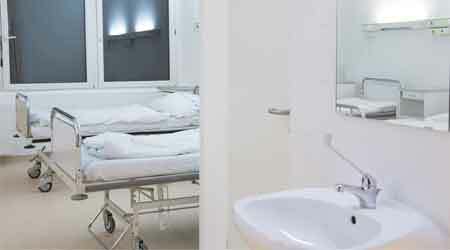 Another factor that can contribute to the cleanliness of patient bathrooms is the level of ventilation. It often needs to exceed code requirements, Williams says. “I find them under-exhausted. You never feel the air moving.” If moisture builds up in the room and isn’t ventilated out, it can breed mold and bacteria.